I love shopping and everyone knows about it!! Nowadays, I prefer to shop at online store because it’s so convenient, lots of time/cost saving (save my petrol, parking and toll fee!) and I can actually get better deals than to shop in offline stores. What if I tell you today, you do not need to fly all the way to Korea and you can enjoy Korean online shopping at the comfort of your own house? http://koreanmall.com/app/ is the 1st Korean Global e-Shopping mall which is selling products made in Korea and more. Koreanmall offers products such as fashion, beauty, food, baby/toddler, home gardens, sports and not forgetting K-pop directly from Korea. I love that there are varieties of category of products and I haven’t seen an e-commerce site that sells Food and K-Pop sections directly from Korea! So, basically the product we see in K-dramas, we can get directly from Korea... No need to wait for them to be launched in Malaysia! This is the Top 10 Best Seller Beauty Products in Koreanmall! 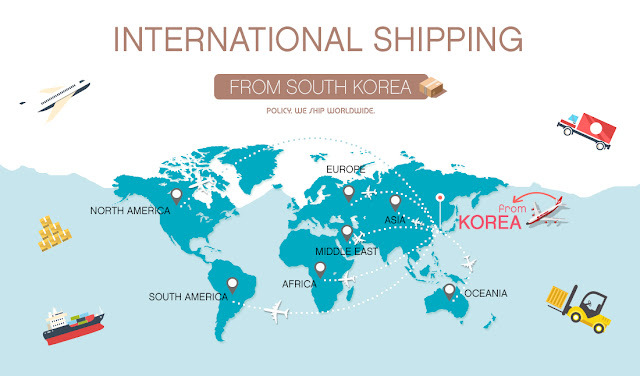 You do not need to worry about the shipping fee when you purchase from Koreanmall because all orders over $49 will be shipped right to your door. Absolutely free using Economy airmail! 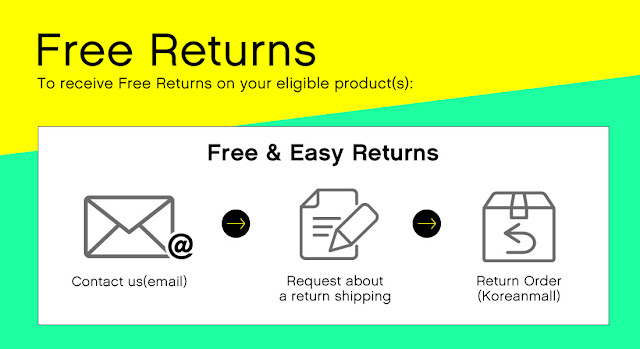 Yay more reasons to shop and enjoy the free shipping! While it’s convenient to shopping online, there are times we are not satisfied with the products we receive. And I appreciate that Koreanmall offers Free & Easy return policy on all orders of $49 or more (exclude the shipping fee) within (14) days of the date you receive the item. I feel so confident shopping on Koreanmall because it pledges to sell Korean products that are Korean Genuine items. And if you find out the products to be unauthentic, Koreanmall will refund you 200% of the price you pay. So rest assured that Korean products in KoreanMall are made in Korea, designed by Korea and Korean brands. With all these promises, I feel so much more secured and confident shopping from Koreanmall! 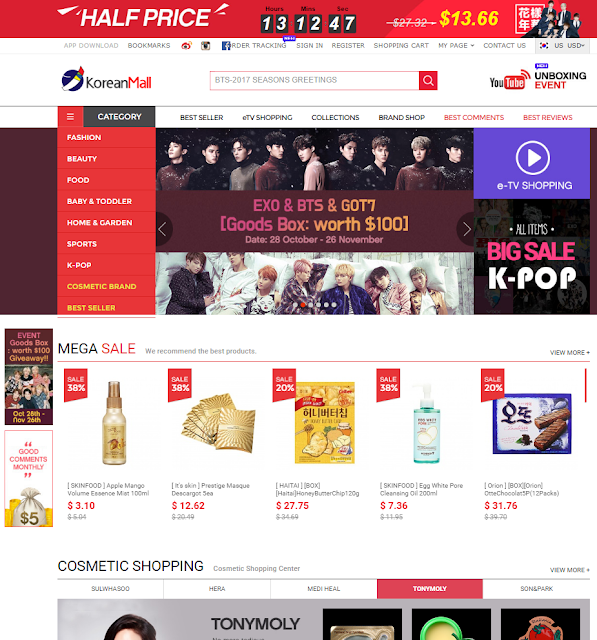 Plus, there are a lot of different payment methods available on Koreanmall for the convenience of shoppers! This is my parcel from Koreanmall. The delivery was pretty fast and smooth. My purchase was properly packed in a box and sealed securely before it arrived at my doorstep. Can you guess what I have purchased from Koreanmall? I like how Koreanmall took extra effort to wrap my items individually with bubble wraps to protect the products. On top of that, Koreanmall also stuffed the box with air pack to make sure shaking/impact is minimised during delivery. My Korean beauty online shopping from Koreanmall! Woohoo... This is my early Christmas gift for myself! Been wanting to try this peel-off mask forever! Finally, I got this from Koreanmall! Love the herbalish smells from mask which has the benefits to purify, clarify dull and devitalized problem skin. Just peel off from top to bottom after 20-30 minutes when the mask dries. Love how my skin felt so much smoother, brighter and somehow slightly hydrated after used. Highly recommending this! This is a new product from Laneige which I have not tried before. I got this because I read that this ultra moisture cream is suitable for winter. And since I’m planning for my winter trip at end of the year, it’s a good time to pick this to try out! The texture is thick & buttery! I can feel the instant hydration treatment when I tried it on. Interestingly not only this can be used as a face moisturer, it also works as a night mask, hair essence, elbow care, makeup retouch, massage cream and makeup base to give radiance to the skin as well. This is a new product from Laneige which promises to re-new, re-energize and re-generate our skin by making sure it’s moisture, smooth and glowing. Although this is an oil essence serum, the texture is pretty lightweight and absorb quickly into the skin leaving it feeling soft almost immediately. I love anything about berry! Hence, I picked up this high-concentration of multi berry extract yogurt pack from Laneige to try! Not only my skin smells sweeter after the mask, it also felt more hydrated and smoother. My friend, Cynthia, recommended this brand. This is a skincare and makeup booster all-in-one! The moisture gel promises to make your skin texture smooth, all thanks to the collagen capsules containing non-sticky, refreshing moisturizing oxygen gel and rose oil. I use this as my makeup base before applying my foundation, it seems to make my foundation stays longer and hydrated. I have been wanting to try this BB cushion ever since I read the high raved review made by Parisb, she said that this product makes her love cushion foundation! Got to agree that this lightweight cushion foundation goes beyond providing long-lasting coverage with a flawlessly satin, soft matte finish. Honestly, I am very happy with my purchase from Koreanmall. My K-Beauty products were reasonably priced and they arrived very fast in good condition directly from South Korea. I love the free international delivery for purchase over $49.